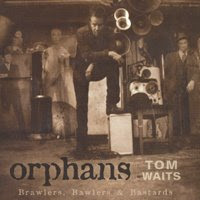 Orphans: Brawlers, Bawlers & Bastards is a limited edition three CD set by Tom Waits, released by the ANTI- label on November 17, 2006 in Europe and on November 21, 2006 in the United States (see 2006 in music). The set is a collection of 24 rare and 30 brand new songs. Each disc is intended to be a separate collection in itself; the first disc with the more roughcut rock and blues cuts, the second the more melancholy tunes and ballads, and the third disc having the more experimental songs & spoken word pieces. Although the liner notes claim "56 songs, of which 30 are new", there are only 14 songs on the collection which can readily be found on other albums. Waits has described the collection as "A lot of songs that fell behind the stove while making dinner, about 60 tunes that we collected. Some are from films, some from compilations. Some is stuff that didn't fit on a record, things I recorded in the garage with kids. Oddball things, orphaned tunes". The Orphans Tour was conducted in support of the album prior to its release. Thomas Alan Waits (born 7 December 1949) is an American singer-songwriter, composer, and actor. Waits has a distinctive voice, described by critic Daniel Durchholz as sounding "like it was soaked in a vat of bourbon, left hanging in the smokehouse for a few months, and then taken outside and run over with a car." With this trademark growl, his incorporation of pre-rock styles such as blues, jazz, and vaudeville, and experimental tendencies verging on industrial music, Waits has built up a distinctive musical persona. He has worked as a composer for movies and musical plays and as a supporting actor in films, including The Fisher King, Coffee & Cigarettes, Down by Law, Bram Stoker's Dracula, Wristcutters: A Love Story, and Short Cuts. He was nominated for an Academy Award for his soundtrack work on One from the Heart. Lyrically, Waits' songs contain atmospheric portrayals of bizarre, seedy characters and places, although he has also shown a penchant for more conventional ballads. He has a cult following and has influenced subsequent songwriters despite having little radio or music video support. His songs are best-known to the general public in the form of cover versions by more visible artists—for example, "Jersey Girl," performed by Bruce Springsteen; "Downtown Train" and "Tom Traubert's Blues" performed by Rod Stewart; and "Ol' '55," performed by the Eagles. Although Waits' albums have met with mixed commercial success in his native United States, they have occasionally achieved gold album sales status in other countries. He has been nominated for a number of major music awards and has won Grammy Awards for two albums, Bone Machine and Mule Variations.